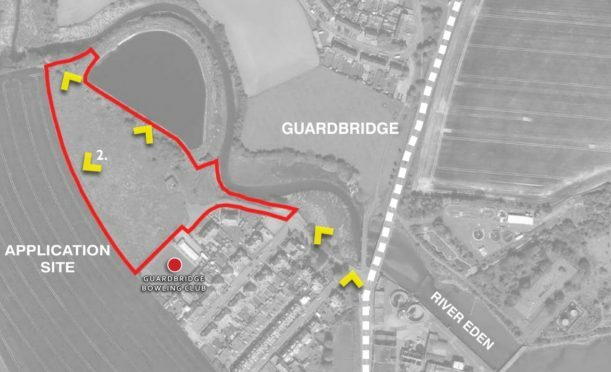 The proposed site at Guardbridge. Another major housing development has been earmarked for a Fife village, just months after plans for hundreds of new properties were submitted. McHale Enterprises is seeking planning permission in principle for a near two-and-a-half hectare site adjacent to Motray Park in Guardbridge, with up to 60 homes planned alongside a reservoir which used to serve the former Eden Mill paper works. The proposal comes after Persimmon Homes lodged an application for 357 residential units and infrastructure on land at Seggie Farm to the south-west last year – a project which would effectively double the historic village’s population if it gets the go-ahead. Just under a third of the 60 homes planned for the land near Motray Park will be classed as affordable housing on disused former private recreation ground adjoining Guardbridge Bowling Club. Concerns have already been raised locally about the plans during public consultation. Critics say the development will increase traffic in the area and there are fears about the height of the proposed houses in relation to the bowling green, which could also be affected by debris and dust during the building phase. However, a statement from McHale Enterprises states these issues can be overcome and the firm hopes to secure approval in principle before bringing forward a more detailed application. “These proposals represent an excellent opportunity to develop this greenfield site which is allocated for housing in the Fife Local Development Plan,” the company said. The plans include an access link to the disused railway line and the potential for further paths that would connect the site to the primary school and the future community woodland at Seggie Farm. Scottish Water has been consulted and says there is currently sufficient capacity at the Lomond Hills Water Treatment Works and Guardbridge Waste Water Treatment works to service the proposed development.